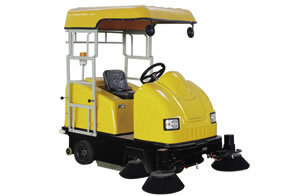 The sanitation street sweeper is a kind of electric ride on sweeper. This machine has an automatic cleaning system with the functions of dust absorption, ground sweeping and water spray. It is driven by electricity. Besides the electric ride on sweeper MN-XS-1750 adopts a high efficient roller-shaped sucking filter. 2. Adopting advanced high-performance maintenance-free batteries, no leakage, no harmful gas generation. 4. Reliable and high-quality components can help to efficiently reduce maintenance and repair costs. 6. Imported electronic control devices, overcurrent and low-voltage protection devices, reinforced chassis, and bigger dustbin. Nantong Mingnuo Machinery Tools Co.,Ltd is a professional manufacturer and supplier of sanitation street sweeper in China. Apart from sanitation street sweeper, we also offer all closed sweeper; dedicated road sweeper; multipurpose sweeper and industrial sweepers. With good quality and competitive price, the products produced by our company have met the standard of ISO 9001:2000. With 20 years experience, the products from Mingnuo have exported to many countries, such as South America, Europe, North-east Aria and so on. If you are interested in our products, please contact us for details.